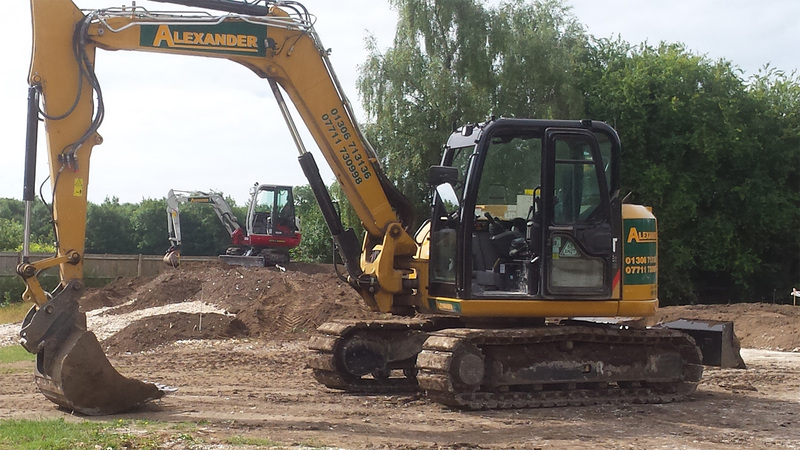 At Alexander Earth we have an extensive range of specialist plant and equipment available for hire, either on self-drive or operated packages with fully trained operators. With an expert team with knowledge and experience, choosing us means you gain access to modern, well maintained and high quality equipment that will achieve the desired results. Our machinery and tools can be booked for work on a day or contract basis throughout the year, and we will safely transport equipment to and from your location. Our fleet of dumpers includes straight tip, swivel and high tip models, all of which are available on a self-drive or operated basis by one of our fully qualified team. Our range of excavators starts from 0.8 tonne-narrow access (680mm wide) up to a 9 tonne capacity and we also have a selection of attachments to suit. Projects we regularly supply machines and equipment for include new-build projects, extensions, lake and ponds, estate management and woodland maintenance. Since 2018 our plant hire services include the powerful CAT 299D2 XHP Track Loader. It is extremely versatile; it’s multifunctional and ideal for land management due to it’s environmentally friendly design. The majority of our plant can be hired on a self-drive basis, whereby we offer a cost-effective package for hire of the machine only. Alternatively, one of our expert and highly skilled operators can operate the machine for you or your business. This is beneficial if you don’t have the in-house expertise and want the guarantee of professional results. Our CAT 299D2 XHP Track Loader is only available on an operated basis due to the training and skills required for its safe and effective use. We can book plant hire and operators both last minute and in advance, should availability allow, and work across the South East including including Surrey, Sussex and Hampshire.